Ace Mattress Recycling’s current facility in West Warwick, RI. Not many people look at an old mattress and see a business opportunity. Fewer look at an old mattress and see an opportunity to improve the community. For Adriane Catlin, CEO of Ace Mattress Recycling, this is exactly what she sees every day when she goes to work. Ace Mattress Recycling employs disenfranchised men to recycle mattresses. The company is doing good on two fronts: employment opportunities for former offenders reduce rates of recidivism by helping them re-integrate into the community; and mattresses recycling reduces the burden of mattresses in landfills. 95% of a mattresses’ contents can be redistributed or reused by other companies. Ace Mattress Recycling is the only mattress recycling company in Rhode Island and continues to grow in a cornered market. In July 2013, Rhode Island enacted a law that requires mattress manufacturers to create a statewide recycling program for discarded mattresses to be implemented by 2016. As a result, the company transitioned last year from a reseller to a full service mattress recycling center in order to meet the increased demand. Ace Mattress Recycling has taken many forms over the past years, but one thing has stayed the same: its social mission to alleviate the burden of mattresses from landfills and create much-needed jobs for disenfranchised men. Some of their employees have been formerly incarcerated and are trying to turn their lives around. “We want to help these folks in need, and those getting out of jail, and help them turn their lives around. The guys we work with are really great guys, they just need an opportunity, and that’s why we want to provide them with jobs. 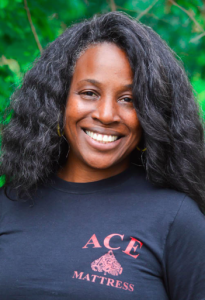 We want to be an inspirational speaker for those who need counseling, and help support them live better lives,” says Walter Catlin, co-founder of Ace Mattress Recycling and Adriane’s husband. Together with the Account Executive, Charity Williams-Ogunba, the team currently includes four full-time employees and a rotating bevy of about a dozen people, ranging from part time workers and volunteers to family members. The rapidly growing company can use all the help it can get. Recycling mattresses is hard work. You need to pull them apart and separate the materials. Some materials need to be further processed, like metal, and some can go right out to be recycled back into the community, like wood. They have given wood to people in the community for DIY projects, for campfires, and other needs, for example. Ace Mattress Recycling leaves no waste, even reselling the palates that the mattresses come in on and donating that money to King’s Cathedral in Olneyville for the Share and Care program. Ace Mattress Recycling also handles wet or bedbug-contaminated mattresses in extreme cases. This shows the process of sanitizing contaminated mattresses (left) before they are pulled apart (center) and disassembled (right). Ace Mattress Recycling has big dreams. Adriane’s husband and co-founder, Walter, says, “I think that if we can get the right group of people we can grow to be as big as Waste Management because mattresses are everywhere.” After Rhode Island, they plan to expand into Massachusetts. The sky is the limit for this rapidly growing social venture, and we look forward to watching them take off. Ace Mattress Recycling is currently looking for opportunities to work with organizations and the government to help grow their business, continue to create jobs, and serve the community. If you are interested in working with them, check out their website and learn more and reach out to them. As the Social Enterprise Greenhouse University Initiative Director, Cayla helps college and university students get involved in social enterprise. The University Initiative is a program funded by the Blackstone Charitable Foundation Innovation Grant to retain students and recent graduates in Rhode Island through enabling them to work on and in social enterprises. Learn more about Cayla here.